I wanted to share some Payasam recipe for this festive season, apart from Sundal's and variety rices I have shared before. This Semiya Payasam was lying in my drafts for more than a month now and this is the correct time for it to go live :). I prefer Semiya Payasam than the Paruppu Payasam when it comes to any occasion. It is very simple and easy to make. I have posted Paruppu Payasam as well, do check it here. 1. In a pan, add some ghee and roast the cashews, raisins. Once it turns golden brown, remove it and keep it aside. 2. In the remaining ghee, roast the Vermicelli until it turns golden brown. Meanwhile combine both the mentioned amount of milk and water, add it to the roasted vermicelli and allow it to cook on low flame. It takes 4 to 5 mins for the Semiya to cook. Once the Semiya is cooked, add the sugar. 3. Stir it continuously, until the sugar dissolves. Then add the powdered cardamom, fried cashews and raisins. Give a quick stir and switch off the flame. Serve the yummy payasam either warm or cold. I prefer having it with Sweet Boondhi. As time goes, the Kheer thickens, so I have added enough water and milk. If more milk is needed, you can add milk while serving. To enhance the richness, you can add rose essence and condensed milk. If using condensed milk, reduce the sugar quantity mentioned in the recipe. I prefer my Payasam to be mild, so cooked the vermicelli by combining milk and water. If you prefer a thick and rich version, skip water and completely use milk. 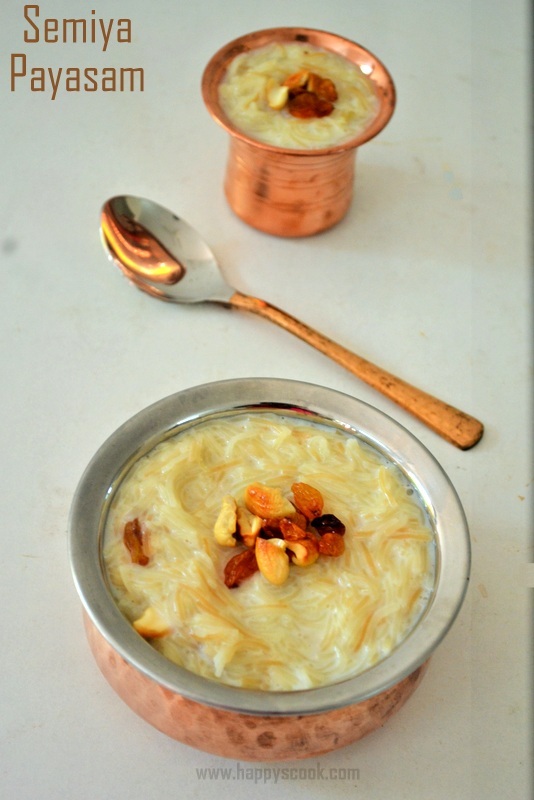 Who can resist to this beautiful bowl,inviting payasam. Semiya paysam Looks delicious delicious. love it.